Happy Saturday everyone hope your weekend is off to a great start! 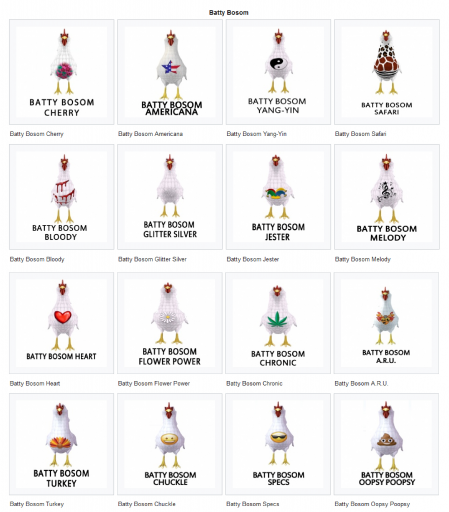 Today I want to shine the spotlight on the Barnyard Birds Batty Bosom trait for our chickens!! Batty Bosom were introduced to breeders on June 1, 2016! The Batty Bosom replaced the Crazed Barnyard Birds. Starting on the 1st of the month Amaretto announced what you must breed together to get that months Batty Bosom! To get a Batty Bosom you must breed two Barnyard Birds that have the trait that was announced for that particular month! Batty Bosom – Thanksgiving 2018 On Thursday, November 22 any nest dropping could have the possibility to randomly get a new Batty Bosom Turkey! Batty Bosom – Chuckle Hidden in the 2018 Gacha Emoji Birds! Batty Bosom – Specs Hidden in the 2018 Gacha Emoji Birds! Batty Bosom – Oopsy Poopsy Hidden in the 2018 Gacha Emoji Birds! Until next time this is Snookie saying Bok Bok & Happy Breeding!